Susan over at You Can Never Have Too Many Books put up a fascinating post on reading horror last week, and having thought quite a bit about this, and having consulted the local book-loving vampire bat (from Whitby no less) I thought I would throw in my tuppenny’s worth! Do you read horror novels? Yes, but not as many as I used to. I’ve become really disappointed by the number of series there are which get less satisfying the longer they go on (Anne Rice and Laurell K Hamilton spring to mind). I find that I’m reading more and more short stories, where the authors have to work harder to get the feeling of dread across to the reader. If so, who do you read? Stephen King is still my favourite (I first read Carrie when I was 15 in 1977, and haven’t really stopped). Christopher Fowler (pre Bryant and May) and Kim Newman are also interesting, along with HP Lovecraft of course, and MR James for ghost stories. New discoveries yet to be read include Dan Simmons and Joe Hill. It used to be anything with vampires would get me hooked (but see my answer to the first question). I don’t mind a bit of blood and gore, but I do like originality, and atmosphere is particularly important for the ghostly stuff. And I do like a bit of Gothic. If you’ve stopped reading horror, why? Still persevering, still looking out for new and interesting things. A lot of the good horror seems to overlap with fantasy quite a bit, which suits me fine. Salem’s Lot is still my favourite King, and is due for a re-read this year, I think. Couldn’t pick a favourite MR James, they’re all too good, and I look out for repeats of the BBC adaptations which are often shown here at Christmas. At the Mountains of Madness and The Shadow Over Innsmouth are my favourite Lovecraft tales. By the way, if you want a good Lovecraftian pastiche, you can’t go wrong with the Neil Gaiman short story Shoggoth’s Old Peculiar (hope I’ve got the title right, couldn’t find my copy). Ooh, I nearly forgot Dracula – still the best vampire story. One of my best holiday experiences ever was listening to the Richard E Grant audio version while being driven across the North Yorkshire Moors – fantastic! I am hanging my head in shame, I only just saw this! thank you so much for doing my meme! It’s good to see that I’m not the only one wondering what happened to horror the past decade or so. There are alot of paranormal books out now, which I don’t think of as real horror. I’m so anxious to get a copy of The Terror by Dan Simmons, and it’s so good to have a horror book to look forward to reading! Have you read Duma Key yet, Stephen King’s new one? I’ve put it on my birthday list for later this month! that’s been getting good reviews over here (finally, after a few years). 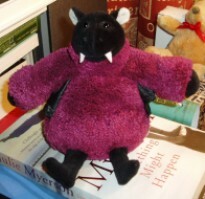 I like your local book-loving vampire bat….I love it’s from Whitby, which is my favourite seaside town in England! And home to Dracula 🙂 nice touch!!! 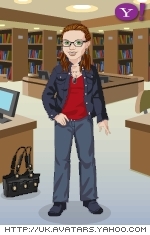 HI Susan, I do have Duma Key (it was a birthday present to myself! )but am saving it for the right moment – I like to throw myself into Stephen when I know I’m not going to be interrupted! I love Whitby too – we try to get there every year during our main break which is in October, but won’t make it this year as we are off to Italy instead. Oh and I discovered I have a copy of Simmons’ The Song of Kali which I think sounds great!